Be aware of scams that frequently target utility customers nationwide. Want to fund that next coffee run? Sign up for My Energy Planner and start saving! Set up or change your Beaches Energy service. Get details on how to start, stop or transfer your service. Check out convenient ways to pay your energy bill. Manage or get helpful information about your account. Beaches Energy Services powers more than 35,000 customers throughout Jacksonville Beach, Neptune Beach, Ponte Vedra, and Palm Valley. We are committed to providing reliable utility services for your home or business at a competitive price with superior customer service that is always above and beyond the expected. State-of-the-art technology helps us identify problems before they occur, and allows us to re-route power to minimize customer outages. Continual inspection and maintenance of equipment, plus an aggressive tree-trimming program, ensure system reliability. Providing electric and natural gas services when our customers need it most is always our highest priority. Being eco-conscious doesn't mean you have to outfit your home or business with lots of pricey upgrades. Many key improvements can be inexpensive or even free! 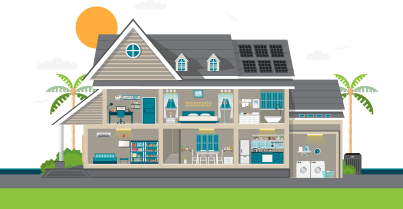 Learn how you can save energy, money and the environment with these quick and easy tips. Beaches Energy Services has received a national commendation from the American Public Power Association for its support in electric power restoration efforts in the towns of Quincy, Chattahoochee and Havana, Florida. The Florida Municipal Electric Association (FMEA) recognized 19 of its public power members for their dedication to the safety of Florida’s communities. The Florida Municipal Electric Association (FMEA) recognized Beaches Energy Services with a Restoring Communities Award for its efforts to quickly and safely restore power. Beaches Energy received an Award of Merit in the Excellence in Public Power Communications Awards for its 2018 Tidings newsletters. Utilities United Against Scams (UUAS) was recently awarded the Toll-Free Industry’s Fraud Fighter Award in recognition of its advocacy and awareness campaign to stop scams that target electric, water, and natural gas company customers.